I get these newsletters, Lowes Creative Ideas for Home and Garden, which I recommend signing up for. It's full of really useful and interesting ideas. 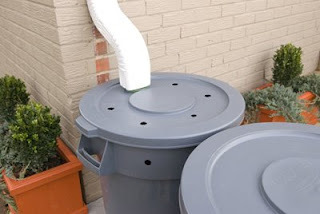 So I got one the other day, and it featured this...water conserving rain barrels. Now, my town charges everyone the same ridiculous amount for water no matter if it's a one person household or four. Which, not for nothing, does nothing to encourage people not to waste water. Most people start getting real lax about their water use after they find this out. Anyway, my garden is right next to a drain. I'm totally going to do this! Looks pretty easy...not that I have drills to cut nice, neat holes, but I'm sure someone I know does. Is it horrible that I don't want one because they're not very attractive? I live in a duplex and the spout in the back drains into the neighbours yard. That leaves me with the front yard... I choose to believe that I can't put one there because of the drainage slope of my yard. BUT... I only water my lawn 2 or 3 times a year. Generally in August when it crunches when I walk on it. BAH. What the heck to I care if my lawn is green or brown? Actually... brown requires less lawn mowing.